The former president of Mexico is trolling Trump hard on Twitter. 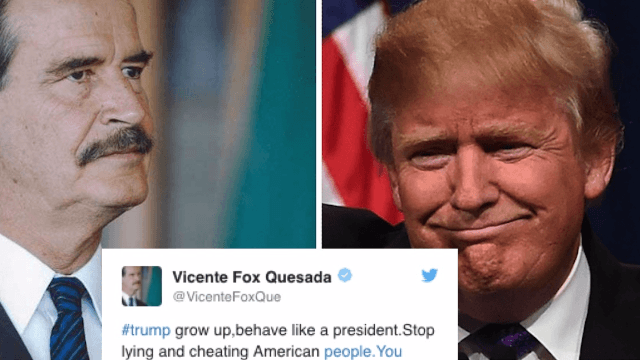 Vicente Fox, Mexico's former president from 2000-2006, has been trying to beat President Trump at his own game by writing scathing posts on Twitter. #trump grow up,behave like a president.Stop lying and cheating American people. You know you lost popular vote. Generally, Vicente Fox, who has been out of office for over a decade, tweets in Spanish. But recently he has pulled out his English to make sure Trump, and the rest of America, gets the message. But things have seriously heated things up in the past few days. 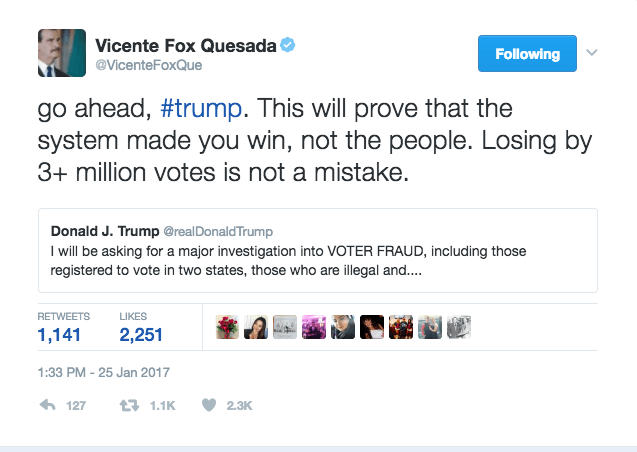 Earlier today, Fox posted this response to Trump's claim that the 2016 election had millions of illegal votes. "The system made you win, not the people." Mi querido Donald: "el pez por su boca muere". Your own words are a reality today. Dearest Donald, you started losing in what you care for the most: rating. That's right! Big mouth, lousy actions and small crowds cheering. 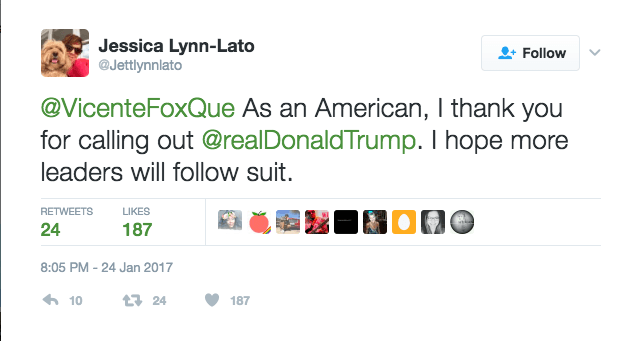 So far, Vicente Fox has not gotten Trump to indulge in his love for Twitter wars, but he has excited a lot of Americans on Twitter. "I hope more leaders will follow suit." "Loving Vicente Fox trolling Donald Trump." Crying laugh is the perfect emoji for this scenario. "It will drive Trump bananas if people like your tweets more than his." Of course, Vicente Fox no longer holds any control over the country of Mexico. So what does Mexico's sitting president, Enrique Peña Nieto have to say about things? Translation: Our foreign policy will be governed by 2 major priorities: diversifying our links with the world; and discuss and negotiate with U.S. Sounds very calm and reasonable, considering.